31/12/14 -- EU grains finished a predictably quiet, low volume, day mixed. At the finish Jan 15 London wheat was down GBP0.55/tonne at GBP133.30/tonne, Jan 15 Paris wheat was EUR0.25/tonne easier at EUR200.00/tonne, Jan 15 Paris corn was up EUR4.75/tonne at EUR162.50/tonne and Feb 15 Paris rapeseed ended EUR3.75/tonne lower at EUR351.00/tonne. For the year, that puts London wheat a little over GBP30/tonne lower than where it was twelve months ago, for a year-on-year decline of 18.6%. Paris wheat has fared considerably better, losing only EUR9/tonne over the course of 2014, for a net loss of only 4.3%. Paris corn ends 2014 with an EUR9.25/tonne loss, or 5.4%. Paris rapeseed meanwhile is down EUR15.50, or 4.2%, during the course of 2014. I suspect that these relatively modest yearly falls for the Paris grains surprise you, as they did me. Part of the reason behind that is of course euro weakness, rather than sterling strength, with the pound having risen steadily against the single currency throughout almost the whole of 2014. Sterling ends the year with a net gain of around 7% versus the euro. Conversely it's fallen around 5.5% compared to the US dollar versus the end of 2013, although that really only tells half the story. The pound has actually shed more than 9% of it's value against the greenback compared to the summer highs of close to 1.72 versus the US dollar. The big stories of the year have really all been about record global wheat, corn, soybean and rapeseed crops in 2014/15, which drove down prices to 4-year lows at harvest time. These records were actually back-to-back records, as production of all four of these grains/oilseeds followed previous all time highs in 2013/14. If you're an arable farmer, things might not look too great right now, but they're a whole lot better than they were just a few months ago. You can also console yourself with the thought that at least you're not an oil baron! For the record, London wheat actually ends the year almost 24% above the post harvest closing low of GBP107.65/tonne set in late September. In Paris, wheat is up 33%, corn up 24% and rapeseed is 14% higher than the closing lows of the year. NYMEX crude incidentally is down 46% compared to last New Year's Eve, and ends the year more than 50% off the summer highs. Perhaps the other big story of 2014 concerns Russia, firstly "acquiring" Crimea, then setting off the subsequent chain of events (combined with the slump in global crude oil values) that has seen the rouble fall off a cliff and the subsequent recent introduction of an export duty on wheat. 30/12/14 -- Soycomplex: Beans closed lower, after trading higher earlier, in what looks like year end profit-taking and book squaring. Floods in Malaysia are said to be threatening to reduce palm oil output. Strong demand from China continues. They are expected to import around 7.6 MMT of soybeans in December, and a further 6.5 MMT in January. Seasonally, imports then start to drop off to coincide with Chinese New Year. South American weather leans favourable. Argentine soybean planting is now 90.6% complete, up 9.4 points on last week, said the Buenos Aires Grain Exchange. They held steady with their forecast for 2014/15 plantings of 20.6 million hectares, up 600,000 ha from a year ago. Canadian canola exports for the first 20 weeks of the 2014/15 season are 3.48 MMT, a 16% rise versus a year ago. Jan 15 Soybeans closed at $10.37 3/4, down 4 cents; Mar 15 Soybeans closed at $10.44, down 4 3/4 cents; Jan 15 Soybean Meal closed at $369.50, down $7.90; Jan 15 Soybean Oil closed at 32.89, up 10 points. Corn: The corn market closed around 6 cents lower. Fund money is preparing to "rebalance" their positions early in the new year, with some suggesting that they need to sell around a net 20,000 corn contracts. China are said to be about to start auctioning off corn, beginning with an offer of around 3-5 MMT in the first week of January. They've been buying large volumes of sorghum recently instead. Yesterday's weekly export sales total of 584,300 MT was the largest single weekly sorghum sales total in 19 years, and was 77% above the previous 4 week average. China (357,300 MT) and "unknown" (presumed to be China, taking 227,000 MT) were the sole buyers. Weekly US sorghum shipments of 323,900 MT were all to China. 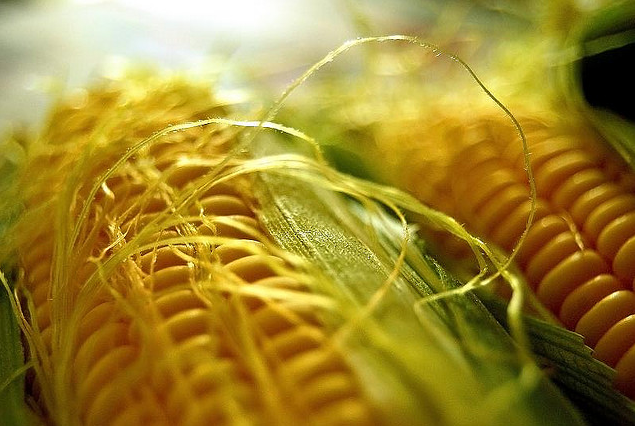 The USDA announced 157,500 MT of US corn sold to Mexico for 2014/15 shipment. The Buenos Aires Grain Exchange reported Argentine corn for grain planting at 74.5% complete, up 9 points on last week. They forecast the planted area down 21% at 3 million hectares. Mar 15 Corn closed at $4.06 1/2, down 6 1/4 cents; May 15 Corn closed at $4.15, down 6 1/4 cents. Wheat: The wheat market closed with double digit losses. Year end profit-taking was a likely feature. US wheat prices are seen generally being too expensive to win much export interest, a notion backed up by yesterday's weekly sales total of less than 300 TMT. US wheat did manage to win a share of Iraq's 200 TMT hard wheat purchase though, even if at $333.87 CIFFO it was the most expensive in the line-up. Canada reported wheat shipments (excluding durum) were up 2% at 6.54 MMT during the first 20 weeks of the 2014/15 season. The Buenos Aires Grain Exchange reported a 12 percentage point rise in Argentine wheat harvesting to 87.7% complete. They held steady with their production forecast at 11.5 MMT, although noted that they might reduce that a little if the current drop in yields being observed in southern La Pampa and Buenos Aires continues for a few more days. Part of the anticipated index fund rebalancing early in the new year might see them selling some wheat. China are also expected to start auctioning off around 2 MMT of government owned wheat stocks January 6-8th. Mar 15 CBOT Wheat closed at $6.02, down 13 1/2 cents; Mar 15 KCBT Wheat closed at $6.36, down 11 1/2 cents; Mar 15 MGEX Wheat closed at $6.27 1/4, down 10 cents. 30/12/14 -- EU grains drifted mostly lower heading into year end. Trade was predictably thin, and fresh news was lacking. At the close Jan 15 London wheat was down GBP1.10/tonne at GBP133.85/tonne, Jan 15 Paris wheat was up EUR0.25/tonne to EUR200.25/tonne, Jan 15 Paris corn was EUR1.00/tonne lower at EUR157.75/tonne, whilst Feb 15 Paris rapeseed was EUR0.50/tonne easier at EUR354.75/tonne. The euro fell close to it's lowest level against the pound in 18 months on renewed talk of a Greek debt default, with a general election there now less than a month away. Greece's radical left Syriza party is leading in the opinion polls, and they say that "austerity will be history" if they win on Jan 25. The weak euro was supportive for French wheat, as too was the notion that the newly introduced Russian wheat export duty will push more interest towards the EU, and France in particular. Current bad weather conditions (snow and ice) in the Black Sea region is said to be causing disruptions to shipping. Iraq bought 200 TMT of hard wheat in a tender, mixed one cargo each of Australian and US origin material and two from Canada. The prices paid were between USD325.93 and USD333.87 on a CIFFO basis. Turkey bought 26 TMT of barley at between USD234-235/tonne C&F for January delivery. 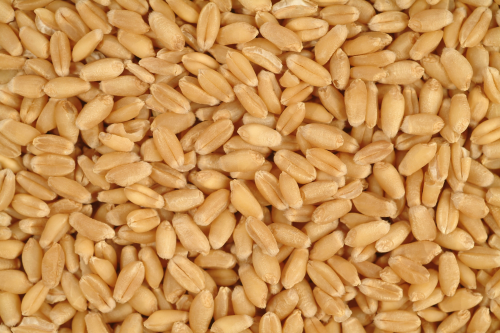 Algeria are tendering for 50 TMT of optional origin milling wheat for Mar/Apr shipment. Heading towards the end of what seems like another very volatile year, the HGCA interestingly say that whilst London wheat prices have varied by more than GBP60/tonne this year, that is in fact the second smallest price fluctuation range since 2007. 29/12/14 -- Soycomplex: Beans and meal closed with small losses on the day. Weekly export sales for beans came in at 635,800 MT for 2014/15 and a further 1,501,600 MT for 2015/16. China took 618,200 MT of the old crop and 1.5 MMT of the new crop. Weekly shipments of almost 2.4 MMT were robust once again. Old crop commitments are now 89% of the USDA target for the season versus around 80% normally. Weekly export inspections came in at 1.42 MMT, which was maybe a bit lower than the trade expected, although this is of course for a holiday week. It looks like US exports are starting to drop off, with reports coming in of early harvest activity in Brazil's western Mato Grosso. Early yield reports are "very impressive" according to Dr Cordonnier. "Farmers are attributing the high yields to the near perfect weather and a lack of disease and insect pressure," he says. There's now some talk of the 2014/15 Brazilian soybean harvest pushing the 100 MMT mark. The USDA are currently at 94 MMT. Jan 15 Soybeans closed at $10.41 3/4, down 5 3/4 cents; Mar 15 Soybeans closed at $10.48 3/4, down 5 1/4 cents; Jan 15 Soybean Meal closed at $377.40, down $2.30; Jan 15 Soybean Oil closed at 32.79, up 33 points. Corn: The corn market closed around a couple of cents lower. That came despite weekly export sales of an impressive 1.7 MMT, around double what the trade had been anticipating. That helped total net commitments to reach around 59% of the USDA target for the season, which is in line with average. Actual shipments came in at just under 800 TMT. Weekly export inspections were 609,613 MT, which isn't too bad for a holiday week. Ukraine's seaports shipped out an impressive 667.4 TMT of corn in the past week, which is 80% of the weekly grain export total, said APK Inform. Corn exports for the season (to Dec 24) are 6.6 MMT, say the Ukraine Ag Ministry. Russia say that they've exported 1.1 MMT of corn so far this season. Turkey tendered for 100 TMT of corn for Feb/Mar shipment, with Russia and/or Ukraine possibly the most likely favourites to win the business. The Philippines said that they'd harvested a record 7.75 MMT of corn this year, up from 7.37 MMT a year ago. That total almost covers the country's domestic consumption, which is estimated at around 8 MMT this year. Mar 15 Corn closed at $4.12 3/4, down 2 cents; May 15 Corn closed at $4.21 1/4, down 1 3/4 cents. Wheat: The wheat market closed firmer, but off session highs. Trade reaction to the export duty news out of Russia is mixed. Benson Quinn said that it "is a bearish feature as the execution of trades in the Jan slot will not be interrupted." It remains to be seen whether January shipments do indeed run smoothly, as there has already been some suggestion that Russia will continue to use "additional administrative measures" to prevent excessive grain exports. The Russian Ag Ministry say that these are 30% up on year ago levels as of Dec 24. Weekly US export inspections of only 293,100 MT were pretty poor, indicating that US wheat is less likely to be the leading beneficiary of any disruption to supplies out of the Black Sea. There were further modest sales of 35,500 MT for 2015/16 shipment. Actual shipments of 385,100 MT were down 7 percent from the previous week and 10 percent below the prior 4-week average. Still, total old crop commitments are 72% of the USDA target for the season versus 70% normally. Talk of possible damage to winter wheat crops in southern Russia in particular continue to circulate. Mar 15 CBOT Wheat closed at $6.15 1/2, up 4 3/4 cents; Mar 15 KCBT Wheat closed at $6.47 1/2, up 3 1/4 cents; Mar 15 MGEX Wheat closed at $6.37 1/4, up 5 3/4 cents. 29/12/14 -- EU grains closed a two-sided session mostly lower. Wheat was still playing catch-up with a US market that closed with significant losses on Christmas Eve. The day ended with Jan 15 London wheat down GBP0.40/tonne to GBP134.95/tonne, Jan 15 Paris wheat was EUR1.00/tonne lower at EUR200.00/tonne, Jan 15 Paris corn was EUR2.75/tonne easier at EUR158.75/tonne, whilst Feb 15 Paris rapeseed ended up EUR1.75/tonne at EUR355.25/tonne. The trade is still digesting the news of a Russian wheat export duty of a minimum EUR35/tonne starting Feb 1, 2015. It will probably take until next week for things to settle down, with trade thin and many participants still absent until after the New Year break. For all the talk of Russian exports being deliberately restricted by red tape in recent weeks, APK Inform said that Russian seaports shipped out 556.1 TMT of grains last week, up from only 282.5 TMT the week before. Wheat accounted for 319.9 TMT (58%) of last week's total, with barley at 177.1 TMT (32%) and corn 56.1 TMT (10%). The Russian Ag Ministry said that exports had now reached 20.4 MMT, a 30% increase on year ago levels. That total includes 16 MMT of wheat, 3.1 MMT of barley and 1.1 MMT of corn. Offers out of Russia for Feb onwards are now said to be non-existent, with traders appearing to want to concentrate their efforts on shipping what they've already got sold in January. Ukraine seaports meanwhile exported 829.6 MMT of grains last week, APK Inform said. Unlike Russia, they are now majoring in corn, which accounted for 80% of that total. Their Ag Ministry said that exports so far this season (to Dec 24) are slightly behind Russia's at 18.2 MMT, of which 7.9 MMT is wheat, 6.6 MMT corn and 3.6 MMT barley. So Russia's participation as a wheat seller looks to be more or less over between now and the end of June. Ukraine are concentrating their efforts on corn. That should be good news for EU wheat. Kazakhstan said that their 2014 grain harvest came in at 17 MMT, a 6.6% decline on last year. India said that growers there had planted 27.96 million hectares of wheat, which is behind last year's pace when 28.69 million ha had been sown. Turkey tendered for 100 TMT of optional origin corn for Feb/Mar shipment. Jan 15 Soybeans closed Monday at $10.38 1/4, up 7 3/4 cents; Tuesday $10.38 1/2, up 1/4 cent; Wednesday $10.28 3/4, down 9 3/4 cents; Friday $10.47 1/2, up 18 3/4 cents. Net change for the week is up 17 cents. Jan 15 Soymeal closed at $368.40, up $4.90; $371.30, up $2.90; $371.40, up 10 cents; $379.70, up $6.30. Net change for the week, up $16.20. Jan 15 Soybean Oil closed at 32.04, up 7 points; 32.22, up 18 points; 31.93, down 29 points; 32.46, up 53 points. Net change up 49 points. Mar 15 Corn closed at $4.11 3/4, up 1 1/4 cents; $4.14, up 2 1/4 cents; $4.07 3/4, down 6 1/4 cents; $4.14 3/4, up 7 cents. Net change up 4 1/4 cents. Mar 15 Wheat closed at $6.25 3/4, down 6 1/2 cents; $6.35 1/2, up 9 3/4 cents; $6.11 1/2, down 24 cents; $6.10 3/4, down 3/4 of a cent. Net change down 21 1/2 cents. For the record, Mar 15 Kansas wheat finished with a net loss of 21 3/4 cents for the week, and Mar 15 Minneapolis wheat was down 16 3/4 cents. Weekly export sales from the USDA, usually released on a Thursday, are delayed until Monday due to the holiday. The regular Friday weekly commitment of traders report is also due for release Monday. Fresh news was relatively scarce, and trade was thin, as you might imagine. Beans, and oil all posted decent gains for the week, corn managed modest advances and wheat was lower, courtesy of a Christmas Eve rout. This may have been linked to profit-taking, and was possibly overdone due to the lack of participants. Fund money was given credit for being a net seller of around 2,500 Chicago wheat on the day, a modest volume that wouldn't normally see a 24 cents collapse. Kansas and Minneapolis wheat saw losses of around 20 cents that day too. Despite the continued collapse in crude oil values, down more than 4% again last week, weekly US ethanol production came in at a record high 992k barrels/day last week - the fourth record week in the past five. Grain prices are becoming divorced from crude oil, and this appears to be directly linked to the "incentive for the world to use more grain based ethanol to meet inclusion mandates" say the HGCA. There's talk of $40/barrel being the level at which Saudi Arabia might reach for the panic button and start choking off excess supply in the market. NYMEX crude closed below $55/barrel on Friday, so we are now only $15/barrel away from being there, and it's only taken a month to lose that much on the way down to where the market currently stands, so we might get to $40/barrel sooner than the Saudi's think. Russia apparently confirmed on Christmas Day that the level set for the much talked about export duty on wheat would be a minimum of EUR35/tonne, which is about USD43/tonne, starting Feb 1. Yet the US wheat markets closed around unchanged on Friday. Was this "buy the rumour, sell the fact" or simply that what few traders were at their desks were unaware of this apparently significant development? Monday's trade might give us the answer to that one. Russian news agency TASS says that Russia has agreed to provide Egypt with 120 TMT worth of wheat before the new rules kick in. To me that would appear to suggest, reading between the lines, that it will not be a free-for-all export deluge between now and the end of next month. It looks like the current unofficial "red tape" export restrictions will persist depending on who the buyer is (and maybe even despite who they are). TASS say that Russia is the third largest wheat supplier to Egypt, accounting for 26% of their imports across the last 6 months. The largest is France (36%) followed by Romania (27%). The EU then certainly look well placed to be the main beneficiary of this new wheat Iron Export Curtain coming down, assuming that they can come up with the quality (France) and/or volume (Romania) required. The Buenos Aires Grain Exchange said that Argentina's 2014/15 wheat harvest is now past 75% complete. They estimate production unchanged from previously at 11.5 MMT, which is up nicely on a year ago. Neighbouring Brazil will be in the market for most, if not all, of their surplus though, meaning that not much of it is likely to travel as far afield as North Africa or beyond. 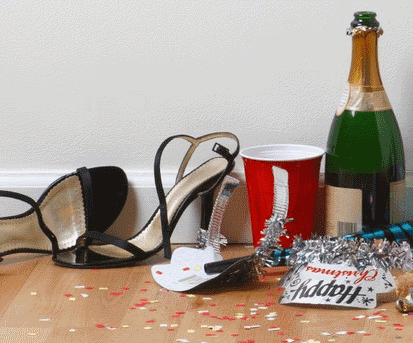 Happy New Year France! 19/12/14 -- Soycomplex: Beans and meal closed with small losses on the day and the week. "Market makers have either stepped to sidelines ahead of the holiday or already out of office for the Christmas break. And that left us with a featureless session," said Benson Quinn. Informa forecast US 2015 soybean plantings at 88.8 million acres, which was far higher than yesterday's USDA baseline projection of only 84 million. It was also a little bit higher than their previous estimate of 88.35 million and would set a new soybean area record. Using a trendline yield of 45 bu/acre then that would give the US a crop of 3.959 billion bushels next year, a total almost identical to this year. That will follow on from what is expected to be a record Brazilian crop and at least near record Argentine production. Jan 15 Soybeans closed at $10.30 1/2, down 4 1/2 cents; Mar 15 Soybeans closed at $10.38 1/2, down 4 3/4 cents; Jan 15 Soybean Meal closed at $363.50, down $1.80; Jan 15 Soybean Oil closed at 31.97, up 8 points. For the week beans were down 16 3/4 cents, with meal losing $3.50 and oil slipping 33 points. 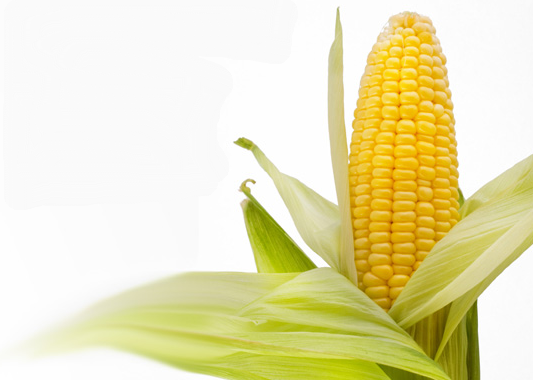 Corn: The corn market closed slightly lower on the day, but with modest gains for the week. Corn put up a decent performance today, given the weakness in wheat to end the week. "Funds were estimated sellers of 2,000 to 3,000 corn contracts, which typically wouldn’t have much effect at all. It didn’t feel like the producer was interested in selling corn ahead of the weekend," noted Benson Quinn. Informa trimmed their forecast for US corn plantings in 2015 from 88.3 million acres to 88 million, the same as the USDA gave us in yesterday's baseline projections. The USDA's figure for this season is 90.855 million, so that would be a drop of a little over 3%. A firmer tone to the crude oil market may have lent some support today. Good interest from China for US DDGS is still being reported, on top of the recently announced 900 TMT in sales, which is friendly for continued buoyant ethanol production, and subsequent domestic corn demand. The ethanol market has been doing its best to ignore the recent demise of crude oil. Mar 15 Corn closed at $4.10 1/2, down 1/2 cent' May 15 Corn closed at $4.19, down 1/2 cent. For the week, Mar 15 corn was up 3 cents. Wheat: The wheat market closed lower on the day, but higher for the week. Some are saying that this was an overdue correction, and that the rises seen earlier in the week were overdone. The market is now trying to figure out if the Russian news is fully priced in. The Russian state owned grain company are said to be due to begin buying grain for the intervention fund at the newly revised higher prices next week. It will be interesting to see how successful, or otherwise, they are. Volumes up until now have been pretty low. A new development is that "India expressed interest in offering wheat to the global market, which would very likely take place if values remain high," said Benson Quinn. They'll be harvestin again come March. Informa estimated the US all wheat acreage at 56.8 million versus the USDA's baseline projection of 56 million. Ukraine said that they'd exported 17.5 MMT of grains so far this season, including 7.8 MMT of wheat. The USDA has them down to export 10.3 MMT of wheat this season, so they've currently shipped out more than 75% of that target. Mar 15 CBOT Wheat closed at $6.32 1/4, down 23 cents; Mar 15 KCBT Wheat closed at $6.66, down 17 3/4 cents; Mar 15 MGEX Wheat closed at $6.48 1/4, down 12 3/4 cents. For the week that still leaves Mar 15 Chicago wheat 25 3/4 cents higher, with Kansas up 31 3/4 cents firmer and Minneapolis up 27 1/2 cents. 19/12/14 -- EU grains closed lower, with wheat giving up a fair chunk of the week's gains, even so wheat both side of the Channel and rapeseed still posted decent advance compared with last Friday. The day ended with Jan 15 London wheat down GBP3.10/tonne to GBP132.30/tonne, Jan 15 Paris wheat was EUR4.25/tonne lower at EUR196.00/tonne, Jan 15 Paris corn was EUR1.50/tonne easier at EUR156.50/tonne, whilst Feb 15 Paris rapeseed ended down EUR0.25/tonne at EUR349.25/tonne. For the week London wheat finished GBP2.10/tonne higher, with Paris wheat up EUR7.25/tonne and rapeseed EUR6.50/tonne firmer. Corn lost EUR0.75/tonne. I guess that weakness in wheat today could be attributed to profit-taking ahead of the weekend and with next week's trade likely to be thin in a holiday shortened week. Russia still dominates the news. The Russian Association of Grain Exporters, who Agrimoney say handles 75% of the country's foreign grain shipments, said it had stopped buying on the domestic market "due to the current conditions and circumstances which are beyond their control." In a statement that may have lost something in translation they were quoted as saying that they will also "prevent further implementation of export contracts as well...due to their civic awareness and the Union’s responsibilities." Members of the Association include most of the leading names in the business, such as Cargill, Louis Dreyfus, Bunge, Aston, Valars etc. Reports also suggest that the Association said that it urged other non-member companies to join the initiative. It looks like those not wishing to do so will simply have the appropriate paperwork withheld anyway. Reports still persist of vessels loaded with grain sat idle waiting for the necessary documentation to leave port, including at least one destined for Egypt - a supposed "approved" destination. Private Egyptian buyers are said to be stepping up their interest in wheat from other origins like Ukraine and Europe. Brussels said that they'd issued almost 514 MT worth of soft wheat export licences this past week, up from 344 TMT a week ago. That takes the total volume released so far to 13.6 MMT. Looking ahead, "very serious drought persists in key winter wheat areas, despite the snow, central Ukraine, Russia Black Earth and Volga districts all receiving less than 40% of normal moisture in the past month. Krasnodar, one of the highest yielding wheat areas in the country, in southern Russia is also very dry," said Martell Crop Projections. 18/12/14 -- Soycomplex: Beans closed higher. Weekly export sales of more than 1 MMT were better than expected, even if 350 TMT of that total was for 2015/16 shipment. Old crop sales of 696,000 MT included 402,400 MT to China. Actual shipments were nearly 1.9 MMT, taking total commitments so far this season to 86% of the USDA's target for the season versus 79% normally. The USDA released their baseline projections, putting the US 2015 soybean planted area at 84 million acres versus private estimates of around 88 million. The Argentine Ag Ministry forecast the 2014/15 soybean planted area at 20.2 million hectares, up 2.2% on last year. They say that Argentine farmers have sold 73% of their old crop beans versus 81% a year ago, and 4.4% of their new crop against 4.8% a year ago. Jan 15 Soybeans closed at $10.35, up 8 cents; Mar 15 Soybeans closed at $10.43 1/4, up 8 cents; Jan 15 Soybean Meal closed at $365.30, up $6.00; Jan 15 Soybean Oil closed at 31.89, up 12 points. Corn: The corn market closed around 2-3 cents firmer. Weekly export sales of 693,500 MT for 2014/15 and 5,000 MT for 2015/16 were in line with expectations. Actual shipments of 754,000 MT were up 11 percent from the previous week and 24 percent above the prior 4-week average. Total commitments so far this season are 55% of the USDA forecast versus 56% normally. The USDA's baseline projections for next year are using a corn planted area figure of 88 million acres. The Argentine Ag Ministry forecast corn plantings this year down almost 10% at 5.5 million hectares. They said that Argentine growers have now got 91.6% of their old crop corn sold versus 84.3% a year ago. New crop sales are at 16.2% versus 6.4% a year ago. Strategie Grains forecast the EU 28 corn crop in 2015 at 67.6 MMT, a 9% drop on this year. France, Romania and Hungary will see a combined drop of 4 MMT in output, they said. Mar 15 Corn closed at $4.11, up 2 3/4 cents; May 15 Corn closed at $4.19 1/2, up 3 cents. Wheat: The wheat market closed higher, although well off the overnight session highs. Weekly export sales of 476,300 MT for 2014/15 and 33,200 MT for 2015/16 were in line with trade ideas. The Russian rouble appears to have stabilised, at least for now. Reports out of there still suggest problems in obtaining the necessary phytosanitary certificates for vessels to sail. "At times, the market feels like it is ready to roll over. However, it doesn’t feel like the speculative seller trusts the wheat market or what the next move in Russia could be," said Benson Quinn Commodities. The Argentine Ag Ministry forecast their 2014/15 wheat crop at 13.2 MMT, a 43.5% increase on last year. Very acceptable yields have been obtained so far, they said. They estimated the crop at 60% harvested. Strategie Grains estimated the EU 28 soft wheat crop at 140.2 MMT next year, with all wheat production at 148.1 MMT. The USDA baseline projection for US wheat plantings for the 2015 harvest is 56 million acres. Mar 15 CBOT Wheat closed at $6.55 1/4, up 6 3/4 cents; Mar 15 KCBT Wheat closed at $6.83 3/4, up 2 1/4 cents; Mar 15 MGEX Wheat closed at $6.61, up 1 1/4 cents. 18/12/14 -- EU grains finished the day mixed. Wheat arced to fresh highs for the move shortly after the opening bell, but gave up a lot of those gains by the end of the session. The day ended with Jan 15 London wheat down GBP0.50/tonne to GBP135.40/tonne; Jan 15 Paris wheat was EUR1.50/tonne firmer at EUR200.25/tonne; Jan 15 Paris corn rose EUR2.25/tonne to EUR158.00/tonne; Feb 15 Paris rapeseed jumped EUR4.75/tonne to EUR349.50/tonne. Jan 15 Paris wheat traded as high as EUR209.25/tonne at one point, more than ten euros up on last night's close. The news out of Russia appears to confirm that they have created a 'de facto' grain export ban to all but Egypt, Turkey, Armenia and India - and only the former two countries are significant buyers of Russian wheat. Egypt say that they are confident that they will get everything they have bought of Russian origin, and they probably will, along with Turkey. Whether they will be able to purchase anything else depends on whether Russian exporters fancy sticking their neck out. Sources in Russia suggest that staff at the Veterinary and Phytosanitary Surveillance Service (VPSS), who are responsible for issuing export licences, have been quietly told to withhold certificates for all but the four destinations mentioned above. Essentially this would appear to mean that Russia are out of the export market, for all but these four, for the time being. Even if Egypt are an approved home, there are reports of delays in obtaining the necessary certificates for vessels bound for that destination too in recent weeks. Other countries with Russian wheat already bought will now be considering their position, and presumably looking for the sellers involved to arrange delivery from other origins. Depending on the price involved these exporters might start talking force majuere that they can't supply the originally contracted grain. 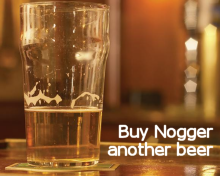 Either way, it creates more buying interest for other origins, like Europe. This is a bit of a windfall opportunity for European and other sellers, who generally have plenty of wheat still to sell. How high prices might yet go is open to conjecture, ultimately knocking two, three, or even more million tonnes off Russia's 2014/15 grain exports doesn't really make a huge difference to the global supply and demand situation. The rouble has finally arrested its steep decline, after massive Central Bank intervention and a huge hike in interest rates to an eye watering 17%, although few would bet against another period of weakness. Prospects for production in 2015 are still under a large cloud of uncertainty, and these could really put some fuel on the fire yet. Meanwhile, talking of 2015 crop prospects, French analysts Strategie Grains today forecast the EU 28 soft wheat crop at 140.2 MMT next year, a 5% fall versus 2014. The UK and Germany will each see a 2 MMT fall in output, they said. Barley production will drop 4% to 58 MMT, and the EU 28 corn crop will decline 9% to 67.6 MMT, they added. Their figures are pretty similar to those of Copa Cogeca from the other day, they went for 139.75 MMT, 55.8 MMT and 68.8 MMT respectively. 17/12/14 -- Soycomplex: Beans closed with small gains at the end of a two-sided session. A trade delegation of Chinese buyers in Chicago were reported to have signed "showcase" deals to import 1 MMT of US soybeans. Abiove estimated Brazil’s 2014/15 bean crop at 91.0 MMT, unchanged from their previous estimate and well below the CONAB estimate of 95.8 MMT and the USDA's 94 MMT forecast. "Weather outlooks continue to have Brazilian production areas getting adequate moisture for their crops with some press given to the drier areas in Argentina as having potential to a reduction in production," said Benson Quinn. There's some talk of increased US soybean sales to Cuba following comments from the Obama administration seeking to end more than 50 years of hostility between the two countries. Trade estimates for tomorrow's weekly export sales report are in the region of 600-800 TMT for beans. Jan 15 Soybeans closed at $10.27, up 3 1/2 cents; Mar 15 Soybeans closed at $10.35 1/4, up 4 cents; Jan 15 Soybean Meal closed at $359.30, up $2.70; Jan 15 Soybean Oil closed at $31.77, unchanged. Corn: The corn market also posted small advances of a couple of cents or so, helped by surging wheat prices. Some news agencies reported that China had approved MIR 162 corn for import, although Reuters said that three sources at large Chinese corn importers that they had contacted said that they had received no such notification as yet. They also reported Chinese buyers booking 900 TMT of US DDGS in the past week, with state-owned COFCO the main buyer. That's something that they'd be unlikely to do without knowledge that approval of MIR 162 was imminent. If they know it's coming then they may have decided to act now before DDGS prices went up, it is thought. US ethanol production was reported at a new record 990,000 barrels/day - the third record week in the past four. South Korea's MFG bought 126,000 MT of optional origin corn for April shipment. South American weather remains generally favourable, although there's some talk creeping in of developing dryness in parts of Argentina. Martell Crop Projections report that "weather conditions in the Midwest have grown progressively drier over the past several weeks. This is reflective of an emerging El Nino, as Midwest winters are often very dry with El Nino." Weekly export sales tomorrow are expected to be around 600-800 TMT. Mar 15 Corn closed at $4.08 1/4, up 2 1/4 cents; May 15 Corn closed at $4.16 1/2, up 2 cents. Wheat: The wheat market closed with strong gains. Turmoil in Russia is the main reason. Various reports appear to confirm that exporters are having extreme difficulty getting export certificates in a timely manner. It's being suggested that Turkey, Egypt, Armenia and India are being singled out for referential treatment, and exports to those destinations will get pushed through, but everybody else can go and whistle. This appears to have brought trade in Russian wheat to a virtual standstill very quickly. Exporters don't want to sell, for fear of getting caught having to pay expensive demurrage bills as vessels sit at the quayside waiting for customs clearance. That means that also neither are they a buyer on the domestic market all of a sudden. That leaves the government's intervention fund program looking a more attractive proposition than it has up until now. There are reports of Argentine wheat now trading into African and Middle Eastern homes, where buyers are shying away from even considering Russian wheat. There should also be a pick up in interest for EU and US wheat too. Note too the absence of large Russian wheat buyer Saudi Arabia from the unofficial list of approved homes. Is that just a coincidence, or a poke in the eye for the country seen by many as being responsible for the collapse in crude oil prices that is causing Russia so much stress at the moment? Mar 15 CBOT Wheat closed at $6.48 1/2, up 25 1/4 cents; Mar 15 KCBT Wheat closed at $6.81 1/2, up 26 3/4 cents; Mar 15 MGEX Wheat closed at $6.59 3/4, up 25 1/2 cents. 17/12/14 -- EU grains closed mixed, but with wheat marching on to fresh highs for the move on the developing Russian situation. Paris wheat came within a whisker of EUR200/tonne, we haven't seen a front month close at that level since May. At the finish Jan 15 London wheat was up GBP1.90/tonne at GBP135.90/tonne, Jan 15 Paris wheat jumped EUR3.75/tonne to EUR198.50/tonne, Jan 15 Paris corn was EUR2.75/tonne lower at EUR155.75/tonne, whilst Feb 15 Paris rapeseed was up EUR0.75/tonne to EUR344.75/tonne. SovEcon said that there are "huge issues" with grain export licences in Russia at the moment, apparently confirming recent rumours. There's more than one way to skin a cat, who needs to upset the WTO with an export ban when the same effect can ultimately be achieved via red tape? Having loaded vessels sat around waiting for the appropriate paperwork for days/weeks on end before they can sail is a very expensive exercise indeed, and one that exporters won't want to be picking up the tab for. Most buyers will be keen to avoid this sort of disruption too, and will soon turn to other origins that are able to ship on time. The HGCA meanwhile said that the recent alarming slump in value of the rouble had "created a big incentive" for Russian farmers not to sell their wheat. Holding onto physical grain was currently a far safer hedge than selling it, they added. Whilst almost all of the talk surrounding Russia is currently about these nearby issues, there's winter kill losses and difficulty in funding the spring planting program and growers ability to fund the purchase of inputs also still to get over in 2015. Whilst crude oil is going for a bath (somebody posted on Twitter today that a barrel of Evian water is now more expensive than a barrel of crude), along with some other markets, there's a school of thought that grains suddenly could offer the chance of better returns in 2015 than many other sectors. Prices are after all still pretty close to recent historic lows. Some spec money might see this as a chance to get in, if not exactly on the bottom rung of the ladder then maybe still a fair way from the top. In other news, the Ukraine Ministry of Economic Development said that the country had exported 15.19 MMT of grains in the Jul/Nov period. That total includes 7.32 MMT of wheat, 3.51 MMT of barley and 4.14 MMT of corn. The USDA has them down to export 10.3 MMT of wheat this season, so that's 71% of that total gone already. The same body forecasts Dec/Jul grain exports at an ambitious looking 21.5 MMT, which would take full season exports to a record in excess of 36.5 MMT. The Ukraine Ag Ministry meanwhile estimate that winter grain plantings are up 8.8% to 8 million ha, despite the loss of Crimea and war in the east. Russia's winter plantings are also well ahead of year ago levels, and the official Ag Ministry forecast there is still for record exports this season. So, everything is apparently officially fine in both countries. Does anyone else get the whiff of a decomposing rodent here? 16/12/14 -- Soycomplex: Beans closed lower on concerns about the Chinese economy and with a weaker Brazilian real heading bearish influences. The latter triggered a bout of Brazilian producer that selling that Benson Quinn said was the heaviest seen since last March. AgRural said Brazil bean planting is 96% complete versus 98% on average. Another bad day at the office for crude oil added to the bearish tone. Fund money was said to have ditched around a net 6,000 soybean contracts on the day. It is estimated that Chinese soybean imports will peak at around 7.5 MMT this month, before falling to around 7 MMT in January and 5 MMT in February (Chinese New Year). This is a normal seasonal trend. Oil World estimated the global 2014/15 soybean crop at 312.9 MMT versus a previous estimate of 309.1 MMT and compared to the 2013/14 production of 285.0 MMT. Their new figure is almost identical to the USDA's 312.8 MMT. Jan 15 Soybeans closed at $10.23 1/2, down 16 cents; Mar 15 Soybeans closed at $10.31 1/4, down 14 3/4 cents; Jan 15 Soybean Meal closed at $356.60, down $8.80; Jan 15 Soybean Oil closed at 31.77, down 50 points. Corn: The corn market closed around 2 cents lower. There continues to be talk of China finally approving MIR 162 corn and DDGS with traces of it for import, but no official confirmation of this has yet been forthcoming. The spectre of crude oil now falling to levels not seen since the dark times of the 2009 aftermath to the sub-prime led financial crisis are hard to ignore, although corn is doing its best to do just that. Ethanol values have held up very well, up until now, but are finally starting to show signs of cracking. Or should that be fracking? South Korea's MFG is shopping for 280,000 MT of optional origin corn for April shipment. South America might be the most likely winner of that business. "While US corn offers have gotten more competitive, I wouldn’t give the US the competitive edge into many potential destinations," said Benson Quinn's Brian Henry. Coceral increased their estimate for the EU-28 corn crop from the previous 72.8 MMT to a new record 73.5 MMT, which is more than 10 MMT up on a year ago. They peg the French crop at a record 16.91 MMT, although some other estimates are in the 17-18 MMT region. Mar 15 Corn closed at $4.06, down 2 1/2 cents; May 15 Corn closed at $4.14 1/2, down 2 cents. Wheat: The wheat market closed higher across all three exchanges. Russia raised their interest rates from 10.5% to a hefty 17% overnight in an effort to stabilise the rouble which had earlier fallen to new all time lows against the dollar and euro. Gossip abounds concerning some form of covert export restrictions being introduced. There's talk that the Russian Veterinary and Phytosanitary Surveillance Service is now saying it will only release phytosanitary certificates to buyers from Turkey, Egypt, Armenia and India. Other reports suggest that some loaded vessels are sat portside waiting for clearance, which currently isn't forthcoming. Russia has announced a hike in the intervention price it will pay to farmers, as was expected. Following the recent demise of the rouble however the prices on the table are still below what is available on the cash market. The most likely beneficiary of Russia standing away from the export market is likely to be Europe before the US however. Coceral raised their forecast for the EU-28 soft wheat crop to 148.5 MMT, which is 12 MMT above last year's level. They see France at 37.45 MMT versus 36.87 MMT a year ago, with Germany at 27.81 MMT versus 24.87 MMT and the UK at 16.52 MMT versus 11.92 MMT. Mar 15 CBOT Wheat closed at $6.23 1/4, up 4 1/4 cents; Mar 15 KCBT Wheat closed at $6.54 3/4, up 7 3/4 cents; Mar 15 MGEX Wheat closed at $6.34 1/4, up 1 3/4 cents. The day ended with Jan 15 London wheat up GBP1.55/tonne to GBP134.00/tonne, Jan 15 Paris wheat was EUR5.00/tonne higher at EUR195.00/tonne, Jan 15 Paris corn was EUR0.25/tonne easier at EUR158.50/tonne, whilst Feb 15 Paris rapeseed ended EUR4.00/tonne lower at EUR344.00/tonne. The Russian rouble had a wild day, even by its recent standards, hitting new all time lows against both the US dollar and euro. At one stage it had lost 50% of its value against the dollar in just six weeks. After last week's 1% interest rate rise caused little more than a momentary ripple in the international currency markets, the Russian Central Bank decided that a bit of "shock and awe" was in order. They announced an interest rate hike from 10.5% to 17%, meaning that rates in Russia have almost doubled in a week! Brent crude meanwhile slipped below $60/barrel for the first time since July 2009, further piling the pressure on the rouble. Whilst Russian wheat prices are good in rouble terms, in dollar terms they're a disaster. Rapidly rising inflation meanwhile could only be serving to encourage farmers that still have grain to sell to hold onto their remaining stocks as a hedge against the demise of the domestic currency. Russian exporters meanwhile are likely to withdraw from the market until the rouble stabilises. There are also now reports that the Russian Veterinary and Phytosanitary Surveillance Service (VPSS) has said that it will only issue export certificates for grain bound for Turkish, Egyptian, Armenian and Indian buyers. That sure sounds like an export restriction to me, if true. Bear in mind that Russia's 2015 budget is said to have been drawn up on the basis of crude oil being $100/barrel and the dollar being worth 35 roubles, when in fact it almost hit 80 today. There's now much discussion of the possibility of a Russian debt default. All of this is also clearly likely to affect Russian growers' ability to fund their spring planting program and the purchase of inputs in 2015. In other news, Coceral raised their estimate for the EU-28 soft wheat crop in 2014 from 147.9 MMT to 148.5 MMT. That's an 8.8% increase on last year. They also increased their corn production estimate from 72.8 MMT to 73.5 MMT, a 16.3% rise on the previous year. For barley production they now go 60.16 MMT versus 59.38 MMT a year ago, and for OSR they are at 24.12 MMT versus 20.8 MMT in 2013. For the UK specifically, they forecast this year's wheat crop at 16.52 MMT (11.92 MMT last year), with barley output unchanged at 7.0 MMT and OSR production at 2.51 MMT (versus 2.22 MMT a year ago). 15/12/14 -- Soycomplex: Beans closed around 7 to 8 cents lower. Weekly export inspections were 1.82 MMT, down from 2.2 MMT a week ago, but still a decent volume. Year-to-date exports are now 25.567 MMT versus 20.879 MMT this time last year. The November NOPA crush came in at 161.2 million bushels. This was below trade expectations, but still a record for the month. South American weather looks friendly. "The forecast calls for above average rainfall in the majority of Brazil soybeans, favouring the interior of the country," said Martell Crop Projections. The FSA reported the 2014 US soybean "prevent planted" area at 841,000 acres versus the November figure of 839,000 acres and 1.702 million acres a year ago. They put the 2014 planted area at 81.626 million acres versus the November figure of 81.392 million and 75.277 million in 2013. Jan 15 Soybeans closed at $10.39 1/2, down 7 3/4 cents; Mar 15 Soybeans closed at $10.46, down 7 3/4 cents; Jan 15 Soybean Meal closed at $365.40, down $1.60; Jan 15 Soybean Oil closed at 32.27, down 9 points. Corn: The corn market closed with small gains, aided by spillover support from wheat. Weekly export inspections were fairly modest at 546,515 MT. Talk that China will finally approve MIR 162 corn and its by-products was friendly. So too is continued chatter that Ukraine is struggling to supply China with all their existing purchases on time, and of the quality they demand. The FSA reported the number of US 2014 "prevent plant" area at 1.606 million acres versus the November figure of 1.594 million and 3.614 million in 2013. They put the US 2014 corn planted area at 86.285 million acres versus the November figure of 85.842 million and 92.359 million a year ago. Russia said that their 2014 corn harvest was effectively concluded at 11.6 MMT, with yields averaging 4.56 MT/ha versus 5.28 MT/ha a year ago. APK Inform estimated Ukraine's 2014/15 corn exports at 18 MMT, down 8.8% from a year ago. Corn continues to do its best to ignore plunging global crude oil prices. Mar 15 Corn closed at $4.08 1/2, up 1 cent; May 15 Corn closed at $4.16 1/2, up 3/4 cent. Wheat: The wheat market closed with decent gains. Belief is growing that although Russia probably will not issue an all out export embargo, they will introduce export restrictions in one form or another, whether covertly or otherwise. The Russian rouble fell to yet another fresh all time low against the US dollar today. The FSA reported the US 2014 "prevent plant" wheat area at 1.38 million acres versus the November figure of 1.379 million and 2.013 million a year ago. Plantings were put at 53.521 million acres versus the November figure of 53.451 million and compared to 53.775 million a year ago. APK Inform estimated Ukraine's 2014/15 wheat exports at 10.8 MMT, a 16.4% increase on a year ago. Weekly US export inspections of 385,974 MT were up 42.8% from the previous week, but still no better than routine. 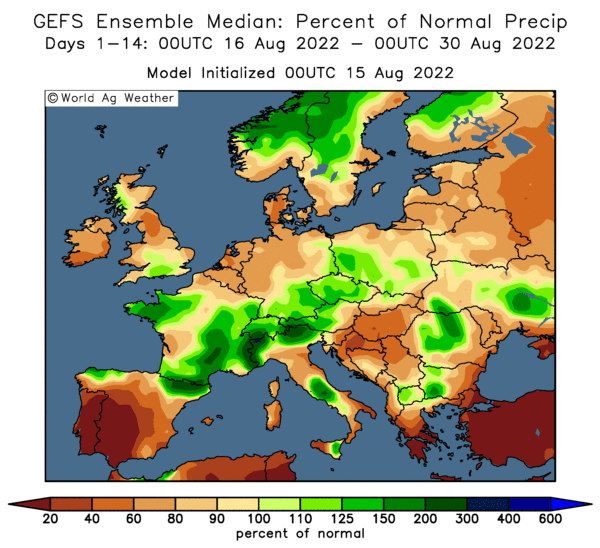 EU winter wheat conditions have taken a turn for the worse with increasing dryness in Germany, Poland and the Czech Republic, but also extreme wetness in the Mediterranean countries Italy Romania and Hungary, say Martell Crop Projections. Mar 15 CBOT Wheat closed at $6.19, up 12 1/2 cents; Mar 15 KCBT Wheat closed at $6.47, up 12 3/4 cents; Mar 15 MGEX Wheat closed at $6.32 1/2, up 11 3/4 cents. 15/12/14 -- EU grains finished the day higher, with Jan 15 London wheat up GBP2.25/tonne to GBP132.25/tonne; Jan 15 Paris wheat was EUR1.25/tonne firmer at EUR190.00/tonne; Jan 15 Paris corn rose EUR1.50/tonne to EUR158.75/tonne; Feb 15 Paris rapeseed jumped EUR5.25/tonne to EUR348.00/tonne. 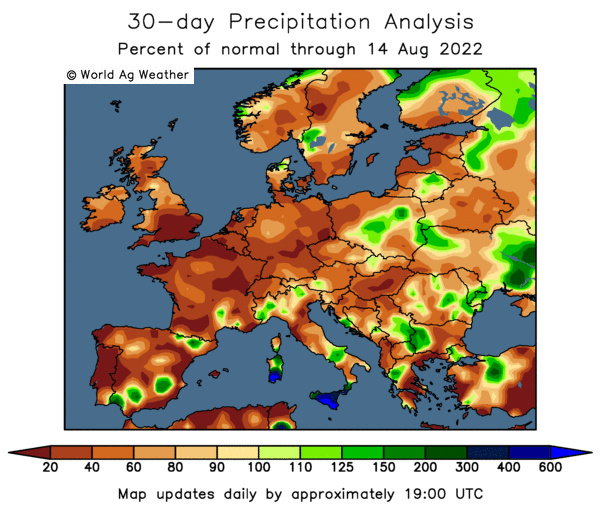 In their final review of the 2013/14 season, the EU Commission's MARS unit said that "generally favourable conditions across the EU-28 have led to forecasted cereal yields that are above the five-year average, except for durum wheat and spring barley. All final cereal crop yields – except those for spring barley – were higher than forecast at the start of the season." "The average EU-28 soft wheat yield estimate for the 2013-14 season is well above the five-year average and just above last year’s figure. Yield estimates are particularly high for most countries in the central, eastern and northern parts of the EU, such as Germany, the UK, Romania, Denmark and Poland. The yield estimate for France is closer to the five-year average and similar to last year’s result. The estimates for Spain, Slovakia, and Croatia are well below the five-year average", they said. For barley "EU-28 yields are slightly above the average of the past five years, but below the excellent results of 2013. The season was positive in most of Europe, with the exception of Spain, which was affected by dry weather conditions in spring," they continued. For corn "yields are at least 25 % above the five-year average in Romania, Hungary and Bulgaria.. A slightly positive campaign is expected in Spain, Poland, the Netherlands, Austria and Lithuania," they added. 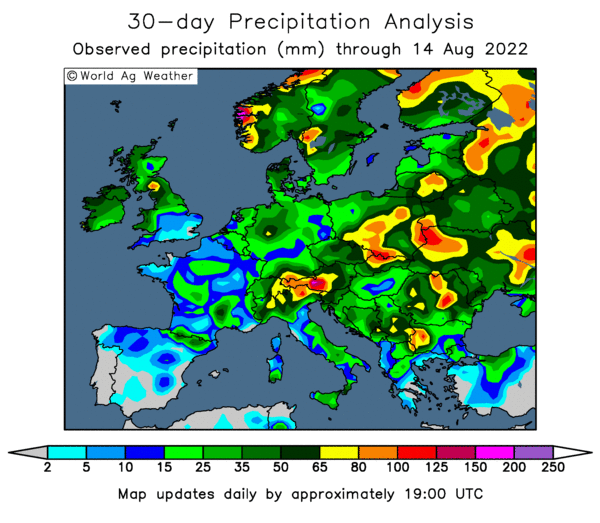 "Overall beneficial conditions for rapeseed crops during this campaign resulted in an excellent season in Germany and Poland (forecast yields are among the highest in our database) and a very good season in the UK and France (forecast yields are above the five-year average)," they concluded. Taking a look at next year's EU crop production potential, Copa Cogeca forecast EU-28 soft wheat plantings to fall 1.6% to 23.92 million ha, with average yields estimated 4.6% lower at 5.84 MT/ha. That pegs production at 139.75 MMT, a 6.2% fall compared to this year. EU barley production in 2015 is seen 4.6% lower at 55.8 MMT, also on a combination of reduced plantings and a drop in yields. Likewise with corn output, which is estimated 5.7% lower at 68.8 MMT. 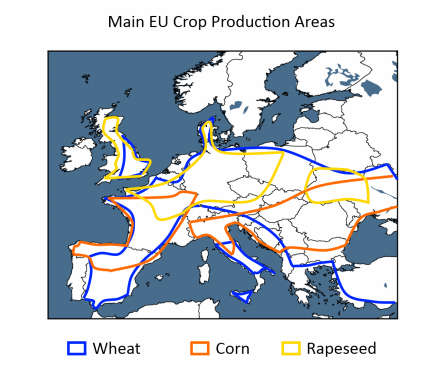 The EU-28 rapeseed crop is also estimated to see a reduced planted area and yields next year, with output pegged 6.4% lower at just over 22 MMT. On a UK specific level, they forecast the 2015 wheat crop falling almost 14% at 14.3 MMT compared to 16.6 MMT this year. They see barley output little changed at 6.9 MMT versus 7.0 MMT this year. They forecast that UK growers to reduce their OSR area by 4% to 647k ha, but with average yields rising to 4.0 MT/ha, they predict production to increase by almost the same percentage to almost 2.6 MMT. I can see a many people shaking their heads at the notion that the UK will produce more rapeseed next year than this, but there we have it. In the ongoing saga concerning Russia, their Ag Minister was today quoted as saying that whilst there will be no outright embargo, they are "going to change the situation with Russian grain exports through dummy offshore companies" without giving specific details of what action they intend to take. Meanwhile the Russian Ministry said the the 2014 grain harvest was essentially now over at 110.8 MMT in bunker weight. Wheat accounts for 62.3 MMT of that, barley 21.2 MMT and corn a further 11.6 MMT. Customs data shows that Russia exported a record 637.7 MMT of barley in October, up 26% versus September and 60% above a year previously. That takes exports for the first four months of the season to more than 1.9 MMT, which is 20% up year-on-year and also a record. Saudi Arabia took more than half that total. APK Inform estimate Russia's 2014/15 barley exports at 4 MMT, up 48% on last year. The same firm also forecast Ukraine's 2014/15 grain exports at a record 32.6 MMT, up 2% compared to last season. They see wheat exports at 10.8 MMT (+16.4%) and those for barley at 3.4 MMT (+37.6%). Corn shipments will however fall to 18 MMT, which is 8.8% lower than last season's record volume. 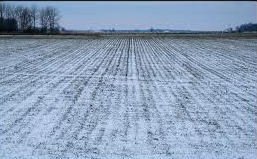 The Ukraine Ag Ministry said that winter grain emergence was now at 95%, rating 82% of what has emerged as being in good to satisfactory condition and 18% weak/thinned. Most of the major winter cropping areas of Russia and Ukraine are currently experiencing warmer than normal temperatures, with these conditions expected to last for the next 10-14 days. That may not necessarily be such a good thing, as what snow cover there is is now melting, and could soon have totally disappeared in the most productive areas of the Ukrainian and Russian plains, say Agritel. 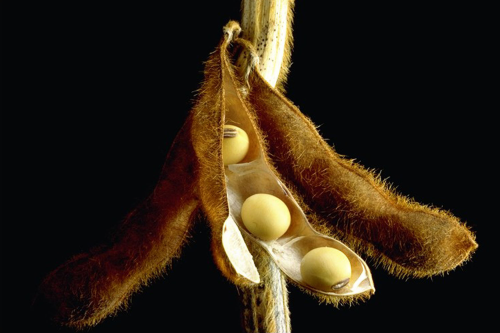 12/12/14 -- Soycomplex: Beans closed a two-sided day with gains of around 5 cents. Expiring Dec 14 meal took a complete nose-dive, other months were mixed. The USDA reported 110 TMT of US beans sold to "unknown" for 2015/16 delivery. A Chinese trade delegation are in town next week, with "showcase" deals likely to be forthcoming. The last time these guys were over in September when 4.8 MMT worth of soybean sales were reported to have been signed. The Argentine Ag Ministry said that farmers there have 71.94% of their 2013/14 soybean crop sold versus 80.39% a year ago. You will recall that the National Bank of Argentina, the country's top agricultural lender, recently said that it will stop extending credit to, and possibly even close the accounts of, farmers who cannot prove that they have sold all of their old crop inventory come Jan 1st. New crop soybeans are 4.23% sold versus 4.43% a year ago. NOPA release their November US crush data on Monday "with estimates of a year on year increase of 3.3% which, if realized, would be at a record 165.4 mln bushels," according to Benson Quinn. Jan 15 Soybeans closed at $10.47 1/4, up 5 cents; Mar 15 Soybeans closed at $10.53 3/4, up 5 cents; Dec 14 Soybean Meal closed at $378.90, down $27.20; Dec 14 Soybean Oil closed at 31.97, up 4 points. For the week Jan 15 beans added 11 1/4 cents, with Dec 14 meal down $15.30 and Dec 14 oil 4 points lower. Corn: The corn market closed with decent gains on fund buying. A rumour that China had approved MIR 162 corn was doing the rounds, but it cannot be confirmed. Reuters reported that Syngenta said that they expected approval "soon" and the US Grains Council said it hoped for confirmation of approval "in the coming days". Reports that Ukraine is struggling to fulfil its obligation to ship 19 cargoes of corn to China, and may default on around 20% of the agreed volume, raises a bit of hope for US corn to again step into the void left. Ukraine exporters are saying that the fighting in the country means that they may not be able to ship the agreed volume by the Feb 2015 quota deadline. Sceptics might suggest that they simply think they can now make better prices elsewhere. Certainly in local currency terms they definitely can. The Argentine Ag Ministry said that growers there have 90.78% of their 2013/14 corn crop sold versus 84.14% a year ago. New crop is 15.31% sold versus 6.15% a year ago. Turkey, said to be the seventh largest importer of the product, announced that they are to ban the import of US DDGs on GM issues. South Korea bought 60,000 MT of optional origin corn for Feb-March shipment. The corn market did its best to ignore the alarming slump in crude oil values, which now stand at their lowest levels since May 2009. "There is a case to be made for institutional traders identifying the Ag sector as their best option to put capital to work," suggested Benson Quinn. Dec 14 Corn went off the board at $3.96 1/4, up 6 1/4 cents; Mar 15 Corn closed at $4.07 1/2, up 9 cents. For the week Dec 14 was 14 3/4 cents higher, with Mar 15 up 12 1/2 cents. Wheat: The wheat market closed higher on more rumours of Russia introducing measures to at least slow up exports, if not go the whole hog and issue a formal embargo. Nearby Dec 14 went off the board on all three exchanges. "Newswires confirmed comments made by an Agricultural Minister that all options would be considered except for an outright export ban, which can’t happen due to Russia’s recently joining the WTO," said Benson Quinn. Intervention prices might be raised next week it seems, but that could be just the tip of the iceberg. As well as the new phytosanitary rules to cope with, there are now reports circulating of an emergency draft law being put together to force Russian companies and exporters to sell half of their foreign currency reserves to the Central Bank in an effort to shore up the ailing rouble. Recent Bank of Russia intervention in the currency markets has done little to help stabilise that for anything more than hours. In other news, Egypt said that it's wheat stocks were sufficient to last until April. That would be assuming that all their Russian purchases turn up! Argentina approved a further 1 MMT of wheat for export. The head of the Rosario Grain Exchange said this week that Argentina's 12 MMT wheat crop this year, plus carryover stocks from last year, will enable them to supply all of Brazil's anticipated 7 MMT import requirement in 2014/15. The Argentine harvest is now past halfway done. The Argentine Ag Ministry said that growers there have still only sold 80.13% of last year's crop, versus 100% this time a year ago. Conversely, new crop wheat is said to be 32.09% sold versus 15.71% a year ago. Dec 14 CBOT Wheat closed at $6.27 1/2, up 17 1/4 cents; Dec 14 KCBT Wheat closed at $6.34, up 10 1/2 cents; Dec 14 MGEX Wheat closed at $6.70, up 50 cents. For the week that puts nearby Chicago wheat up 18 1/2 cents, with Kansas just 1 1/2 cents firmer and Minneapolis up 50 1/2 cents. 12/12/14 -- EU grains closed mostly higher on the day, but with relatively small gains for the week. Renewed rumours concerning the introduction of some form of Russian export restrictions, if not an outright ban itself, were supportive today. At the finish Jan 15 London wheat was up GBP3.55/tonne at GBP130.20/tonne, Jan 15 Paris wheat jumped EUR4.50/tonne to EUR188.75/tonne, Jan 15 Paris corn was EUR2.25/tonne firmer at EUR157.25/tonne, whilst Feb 15 Paris rapeseed was up EUR0.25/tonne to EUR342.75/tonne. For the week, that puts London wheat up GBP1.20/tonne, with Paris wheat EUR0.75/tonne firmer, corn up EUR1.50/tonne and rapeseed EUR2.50/tonne higher. Russia's Agriculture Minister Nikolai Fedorov described the fact that the country had exported almost a third more grain so far this season than in 2013/14 as "a disturbing trend". He said that the Ministry will consider all options (except an embargo) to contain grain exports. One option being touted is to increase the price that the government pay to purchase grain for their intervention program. Despite two bumper harvests in a row, the government hasn't been very successful in buying grain for that on the domestic market, the demise of the rouble means that better returns are available elsewhere. Whether the government will set the intervention price high enough is debatable, so too is where are they going to find the money to pay for it. The rouble hit new lows against the US dollar and euro again today, forcing the Bank of Russia to intervene in the market (again) to try and halt the demise of the currency. Now we have reports of the Russian State Duma drawing up a draft law that would require exporters to sell the Central Bank half of their foreign currency reserves. It isn't hard to imagine the uproar that would cause, and I think we can all guess in who's favour the exchange rate(s) would be set. The Interfax news agency quoted Nikolai Pankov, chairman of the State Duma agrarian affairs committee, as saying that "it was necessary to more actively use the legal framework that exists for regulating prices on socially significant food items." All interesting stuff, and a storyline that is far from over yet. Meanwhile Reuters are carrying a report today that suggests that Ukraine exporters may default on something like 20% of around 1.1 MMT of corn sold to China, as they are unlikely to be able to ship all they have sold to the Far Eastern buyer under a special quota system that expires in February. In other news, Brussels said that they'd issued 344 TMT of EU soft wheat export licences this past week, taking the cumulative season to date total to 13.1 MMT, which is around 5% ahead of this time a year ago. FranceAgriMer said that the French winter wheat crop is 99% sown as of Monday, and that the 2014 corn harvest is now officially complete. Arvalis said that the French corn crop this year could reach a record 18 MMT. FranceAgriMer said that French winter wheat crop conditions were 93% good to very good, unchanged on a week ago (although there was a 2 point shift from the former to the latter) and 13 points ahead of this time last year. Winter barley conditions are also 93% good to very good, similar to last week and up versus 81% a year ago. 11/12/14 -- Soycomplex: Beans closed around 10 cents higher. Weekly export sales of 810,300 MT for 2014/2015 were down 31 percent from the previous week and 20 percent below the prior 4-week average. "Soybean sales have reached 84.5% of the new USDA export estimate, which compares to a 5 year average of 76.8%," said Benson Quinn. "Soy meal sales have reached 59% of the current USDA estimate, which compares to a 5 year average of 51.2%," they added. Actual shipments of 2.4 MMT remain very robust, with China alone taking more than 1.5 MMT of that total. The Rosario Grains Exchange, in their first estimate for the season, forecast Argentina’s 2014/15 soybean crop at 55.0 MMT, which is in line with yesterday's USDA figure. IMEA said Mato Grosso farmers have sold 34.1% of their 2014/15 soybean crop versus 48.8% this time a year ago. Jan 15 Soybeans closed at $10.42 1/4, up 10 1/4 cents; Mar 15 Soybeans closed at $10.48 3/4, up 10 1/4 cents; Dec 14 Soybean Meal closed at $406.10, up $0.90; Dec 14 Soybean Oil closed at 31.93, up 26 points. Corn: The corn market closed around 4-5 cents higher, save for the expiring Dec 14 which closed up 7 1/2 cents. Weekly export sales of 962,800 MT for 2014/15 were down 18 percent from the previous week, but up 9 percent from the prior 4-week average, and in line with expectations. Exports of 678,300 MT were primarily to Japan (246,400 MT), Peru (103,900 MT), Mexico (95,000 MT), Colombia (77,000 MT), Costa Rica (38,400 MT) and Saudi Arabia (36,300 MT). The Rosario Grains Exchange estimated Argentina’s 2014/15 corn crop at 21.5 MMT, unchanged from previous estimate and 0.5 MMT below the USDA's forecast of yesterday. Ukraine said that their 2014 corn harvest is now 98% complete at 27.52 MMT. They said that 2014/15 grain exports were 16.358 MMT, including 5.172 MMT of corn. Fund money was estimated as being a net buyer of around 3,000 corn contracts on the day. The market continues to do a decent job of ignoring the ongoing slump in crude oil prices. Iran said that crude could hit $40/barrel if OPEC doesn't get itself in order soon. US ethanol production though is running at record levels. Dec 14 Corn closed at $3.90, up 7 1/2 cents; Mar 15 Corn closed at $3.98 1/2, up 4 3/4 cents. Wheat: The wheat market closed with good gains. Weekly export sales of 442,300 MT for delivery in the 2014/15 marketing year were up 39 percent from the previous week and 16 percent above the prior 4-week average. They were also towards the top end of trade estimates for once. Egypt's GASC picked up 180 TMT of wheat in their tender, two cargoes being Russian origin and one of French. The prices paid were significantly cheaper than their last purchase, and it was particularly interesting to see Russian wheat be competitive again. Some are suggesting that this was a "let's get it sold and shipped whilst we still can" move. "News eventually began to trickle out that a Russian ag minister made statements indicating they would attempt to reduce exports and would eventually raise Russian intervention prices to keep the domestic market supplied," said Benson Quinn. That's the first time that there's been anything but a flat denial from Russia that this sort of move could be on the cards, even if it has been widely rumoured. Japan bought 143,317 MT of milling wheat for Jan/Feb shipment in their regular weekly tender. The origin was split between US, Canada and Australia. Dec 14 CBOT Wheat closed at $6.10 1/4, up 17 cents; Dec 14 KCBT Wheat closed at $6.23 1/2, up 8 3/4 cents; Dec 14 MGEX Wheat closed at $6.20, up 22 cents. 11/12/14 -- EU grains were mixed, with Jan 15 London wheat ending down GBP0.95/tonne to GBP126.65/tonne, Jan 15 Paris wheat was unchanged at EUR184.25/tonne, Jan 15 Paris corn was EUR0.50/tonne easier at EUR155.00/tonne, whilst Feb 15 Paris rapeseed ended EUR3.00/tonne higher at EUR342.50/tonne. Now that the December USDA WASDE report is out of the way, the trade has developed a distinct "holiday" feel. Egypt's GASC bought three cargoes of wheat for Jan 11-30 shipment in a tender. Two consignments were Russian origin and the other French wheat. With freight included all were priced around the $262.50-263/tonne mark. It was interesting to see Russian wheat feature again. One theory doing the rounds as to why this should suddenly be the case is that traders are looking to "clear the decks" ahead of any possible export ban in the new year. Another is that Russian growers are emerging as sellers again, despite rouble weakness, in order to generate some cash to pay the bills. The Russian rouble fell to new lows against both the US dollar and euro today. Meanwhile Morgan Stanley forecast that the pound could fall to 1.45 against the dollar in 2015. Uncertainty over next year's general election and further fiscal consolidation were the reasons given. With the three leading UK political parties in various states of disarray, a potentially strong showing from UKIP in the polls isn't difficult to imagine, which would certainly put sterling under pressure. That potentially could be helpful to UK wheat exports in the second half of the season, and boy do we need some help. The UK finally exported more wheat than it imported in October, for the first time since May 2012. "The big UK wheat crop of 2014 requires a return to the export market. However, low protein levels in the domestic crop means that imports of high quality milling wheat are likely to remain a factor," said the HGCA. "The upshot is that the UK export pace not only needs to mitigate the size of the 2014 crop but also imports, if stock accumulation and possible price issues are to be avoided at the end of the season," they added. UK growers are certainly currently carrying a lot of inventory, judged on comments made at recent farmer meetings I have attended. It will be interesting to see how long they can continue/are willing to sit on that stock when we get into the new year. Barns three quarters full of unsold grain don't help to pay the bills. Neither do they leave much room for the 2015 harvest once that draws nearer. 10/12/14 -- Soycomplex: Beans closed lower, and near session lows. The decline came despite the USDA raising US 2014/15 soybean exports and lowering ending stocks a bit more than the average trade guesstimate. Exports were increased 40 million bushels, with a corresponding drop in carryout of the same magnitude to 410 million bu. That was a little below the 425 million ballpark that was the average trade guess. There were no changes to 2014/15 production for the US, Brazil, Argentina, China or India. Paraguay and Canada were tweaked a little higher. The world import picture was virtually unchanged, except for a small increase for Indonesia. A 1 MMT rise in US soybean exports was virtually matched by reductions of 700 TMT and 200 TMT respectively for Brazil and Argentina. The US crush was left unchanged, contrary to some people's ideas. World ending stocks therefore came in at around 400 TMT lower than last month at almost 89.9 MMT, which was pretty much in the middle of the 88.5-91.5 MMT range expected. Jan 15 Soybeans closed at $10.32, down 17 1/4 cents; Mar 15 Soybeans closed at $10.38 1/2, down 17 cents; Dec 14 Soybean Meal closed at $405.20, down $6.40; Dec 14 Soybean Oil closed at 31.67, down 24 points. Corn: The corn market closed around a cent or two lower. The USDA lowered US 2014/15 corn ending stocks by 10 million bushels to just under the 2 billion mark, contrary to trade expectations for a 15 million increase. World ending stocks came in at 192.2 MMT, a small rise versus last month and almost slap bang in the middle of trade expectations of between 190 and 194 MMT. The trade was expecting production in Argentina to be unchanged, and Brazil maybe to be lowered by 1 MMT. The USDA went the other way round, cutting Argentina 1 MMT to 22 MMT and leaving Brazil unchanged at 75 MMT. China's production was raised 1.5 MMT to 215.5 MMT, and Europe's was increased 0.5 MMT to a record 73.6 MMT. China's import needs were scaled back from 2.5 MMT to now only 2 MMT "on a larger crop and as policies continue to encourage imports of alternate feed grains." Chinese sorghum imports were raised 400 TMT to 5 MMT. Conab forecast Brazil's 2014/15 corn crop at a large 78.9 MMT, which is some 10 MMT more than Informa said last week. This appears to suggest a larger "safrinha" crop than many think is possible given that this season's soybean harvest is likely to be later than hoped for. The US Energy Dept put ethanol production at a new record 988k barrels/day for the past week. Dec 14 Corn closed at $3.82 1/2, down 1/2 cent; Mar 15 Corn closed at $3.93 3/4, down 1 1/2 cents. Wheat: The wheat market closed lower. The USDA estimated US ending stocks at 654 million bushels, up 10 million from last month. "US stocks are forecast slightly higher year-to-year in spite of a smaller crop as high relative prices make exports less competitive," they said. World wheat production was raised by more than 2 MMT to a new record 722.2 MMT. That came courtesy of a surprise hike in output for Canada, up from the 27.5 MMT forecast last month to 29.3 MMT. Kazakhstan's crop was also raised, up from 12 MMT to 12.5 MMT. Australia's crop was left unchanged at 24 MMT where some had expected a reduction. World ending stocks were increased 2 MMT to just shy of 195 MMT. These were only expected to come in around 191.8 MMT, from within a range of guesses from 189.5 MMT to 193.2 MMT. "Global wheat consumption is projected at a record in 2014/15. Food use is expanding because of population growth, urbanization, and rising incomes. Growth is particularly strong in Sub-Saharan Africa and Southeast Asia. Even with consumption at a record, exporter ending stocks are up nearly 20 percent from last year," they noted. Dec 14 CBOT Wheat closed at $5.93 1/4, down 7 1/4 cents; Dec 14 KCBT Wheat closed at $6.14 3/4, down 2 1/4 cents; Dec 14 MGEX Wheat closed at $5.98, down 6 cents. 10/12/14 -- EU grains finished the day lower, with Jan 15 London wheat down GBP1.20/tonne to GBP127.60/tonne; Jan 15 Paris wheat was EUR2.25/tonne easier at EUR184.25/tonne; Jan 15 Paris corn fell EUR1.25/tonne to EUR155.50/tonne; Feb 15 Paris rapeseed ended EUR3.50/tonne weaker at EUR339.50/tonne. France said that it had exported 1.68 MMT of soft wheat in October, a near 17% rise on a year previously. The top homes were Algeria (293 TMT) and Egypt (252 TMT). FranceAgriMer increased their forecast for French soft wheat exports by 1% from last month to 17.28 MMT for the current season. Even so that's still 13% lower than the volume shipped out in 2013/14. Ending stocks will therefore rise almost 6% to 4.547 MMT, they predict. They also increased their forecast for French barley exports, up 3% from last month to 6.1 MMT. That's also a 20% jump on last season. Even so, ending stocks here are also still up year-on-year, seen rising more than 25% to 1.3 MMT. They said that this year's French grain harvest was 71 MMT, a 7% rise versus 2013. Wheat production was up 2% to 37.1 MMT, and barley output up 13% to 11.7 MMT, they said. The 2014 French corn crop finally came in at 17.3 MMT, an all time high and a 19% increase compared to 12 months ago, despite a lower planted area, they added. The UK meanwhile had it's best wheat export month of the season so far in October, shipping out more than 218 TMT. Spain was the largest buyer, with (unusually) Algeria in second place. That takes exports for the season so far (Jul/Oct) to almost 507 TMT. That would put us in line to export 2 MMT of wheat in 2014/15, if we continue at the same pace. Defra estimate the UK exportable surplus at 3.5 MMT this season. Late in the day the USDA released their December world supply and demand numbers. EU wheat exports were raised by 1 MMT from last month to 29 MMT for the current season. That's still a reduction of almost 2 MMT on last season though, despite the fact that current exports are ahead of even last year's record pace. Russia's wheat exports in 2014/15 were trimmed from 22.5 MMT to 22 MMT (although that's still a record volume), and Ukraine's were tweaked higher, up from 10 MMT to 10.3 MMT. There was also a 0.5 MMT increase for Kazakhstan to 5.8 MMT. Egypt's imports were increased from 9.5 MMT to 10 MMT. Wheat production in Europe this season was left unchanged at 155.4 MMT, consumption was lowered 1.5 MMT to 126.5 MMT and ending stocks here were raised 0.5 MMT to just over 17 MMT. "The EU is forecast to be the world’s largest (wheat) exporter and prices currently are the most competitive. Russia’s exports are projected at a record, while Ukraine’s exports are its second highest. Even though these countries are exporting large amounts of wheat, they are still expected to have a surplus, which will continue to pressure prices," they said. In other news, the HGCA said that "fears around winter crop condition in parts of Russia and Ukraine look to be subsiding for now as forecasters project less harsh temperatures and greater snow cover in the coming days." 09/12/14 -- Soycomplex: Beans ended with fairly modest 5-6 cents gains ahead of the release tomorrow's USDA WASDE report. That is expected to reflect the current very strong pace of US soybean exports by raising those from the existing forecast of 46.8 MMT, with a subsequent lowering in ending stocks. These were projected at 450 million bushels last month, but could come in around the 425 million mark this time round. Strong demand for meal could also lead them to up the size of the US crush this season, also potentially eating into those ending stocks and reducing them further. World soybean ending stocks are expected to be around 88.5-91.5 MMT versus 90.3 MMT a month ago. Conab are also due to release their revised Brazilian production numbers tomorrow as well. Jan 15 Soybeans closed at $10.49 1/4, up 5 1/2 cents; Mar 15 Soybeans closed at $10.55 1/2, up 5 3/4 cents; Dec 14 Soybean Meal closed at $411.60, up $10.10; Dec 14 Soybean Oil closed at 31.91, up 14 points. Corn: The corn market closed higher in what looks like book-squaring and short covering ahead of tomorrow's report. US corn ending stocks are forecast to rise around 15 million bushels to 2.023 billion bu in that. Argentine production will probably be left unchanged at 23 MMT, but Brazil's might be lowered from the current 75 MMT it is thought, with some other analyst's estimates below 70 MMT. The late planting of their full season soybean crop is likely to eat into their second crop corn area it is thought. Current corn prices in Brazil also offer little incentive. The world ending stocks figure is expected to come in between 190 and 194 MMT, according to a Bloomberg survey. Last month's figure was 191.5 MMT. The trade will also be looking at Conab's take on Brazilian corn production tomorrow, and in addition to that we will also have the weekly US ethanol grind data from the US Energy Dept. Last week's production was 962,000 barrels/day. Ukraine said that they'd now exported more than 5 MMT of corn this season. Dec 14 Corn closed at $3.83, up 5 1/2 cents; Mar 15 Corn closed at $3.95 1/4, up 5 cents. Wheat: The wheat market closed sharply lower. The trade is wondering what tomorrow's report will hold for wheat. It seems that there is a possibility that the USDA might lower projected US wheat exports in 2014/15 from last month's 25.5 MMT estimate. That could raise ending stocks from the 644 million bushels estimated in November. EU wheat exports on the other hand might rise from last month's 28 MMT. World ending stocks are expected to come in around 191.8 MMT, from within a range of guesses from 189.5 MMT to 193.2 MMT, and versus 192.9 MMT a month ago. Essentially, there is no shortage of wheat around at the moment, and although demand is also buoyant, it's not generally US wheat that the world is buying. ABARES cut their forecast for the Australian wheat crop by 1 MMT to 23.2 MMT. "The worst damage has occurred in Victoria where the wheat harvest is pegged down 28%. Western Australia, the leading wheat state, is expecting a 20% shortfall," said Martell Crop Projections. Dec 14 CBOT Wheat closed at $6.00 1/2, down 9 1/2 cents; Dec 14 KCBT Wheat closed at $6.17, down 17 cents; Dec 14 MGEX Wheat closed at $6.04, down 13 cents. 09/12/14 -- EU grains closed mostly lower, with wheat down after the Russian Deputy PM said that the subject of possible grain export restrictions hadn't even been discussed at today's cabinet meeting of government ministers. At the finish Jan 15 London wheat was down GBP1.30/tonne at GBP128.80/tonne, Jan 15 Paris wheat fell EUR2.50/tonne to EUR186.50/tonne, Jan 15 Paris corn was EUR0.25/tonne firmer at EUR156.75/tonne, whilst Feb 15 Paris rapeseed was unchanged at EUR343.00/tonne. The French Farm Ministry said that the country's winter wheat area was a six year high of 5.08 million hectares, up 160k ha on last year. Durum plantings are seen up almost 10% to 309k ha, although this is still an historically low area. 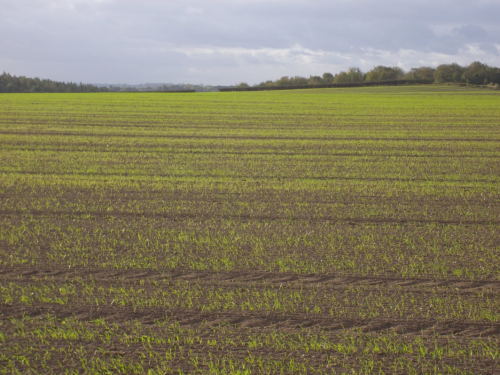 Winter barley plantings were also forecast at a 6 year high of 1.26 million hectares, up 14.5% versus last year. Where's the extra area coming from? Partly winter OSR, where plantings for next year's harvest are seen falling to 1.486 million ha, although that's still only a relatively modest 1% decline on a year ago. Rusagrotrans said that Russia had exported 2.99 MMT of grains in November, a 13% decline compared to October's 3.42 MMT. They noted a "significant slowdown" in exports towards the end of the month. Whether this is simply down to adverse weather conditions, seasonal factors, or the much talked about new phytosanitary rules and/or delays in obtaining the necessary export certificates is unclear, but the situation merits watching. Wheat accounted for 68.5% of November's exports, down from 72% in October. Barley's share rose to 21.3% from 18.3%, and corn's fell to 7.7% from 8%, they added. SovEcon apparently said that they expect December's Russian grain exports to remain high due to the weakness of the rouble however. The Ukraine Ag Ministry said that the country had exported 16.22 MMT of grains so far this season, including 7.57 MMT of wheat, 3.37 MMT of barley and 5.09 MMT of corn. A spokesperson for Ukraine's DZI said that 2014/15 grain exports could reach 35 MMT, a 3 MMT rise compared to last season's record, although this would depend on the political, economic and world market situation, they added. All eyes are now on the USDA who are due to release their December world supply and demand numbers tomorrow. I'll be looking for them to potentially raise 2014/15 EU-28 wheat exports from the existing 28 MMT estimate, and possibly trim US exports a little.